The best race ever on recent TT dvd's has to be the 1000cc production race on the 2003 review. But that has now been overshadowed by a very simple trick on this DVD. Lets point the camera back at the rider (in this case Richard Britton) and see what we come up with. Why this is I do not know, it does sound very dull, because you cannot see where he is going or the speed he is going but you can see just how on the edge these speed demons are and the noise of the engine banging off the rev limiter is sheer class. As for the racing itself well for the forst time ever you can visually see that they are going faster then they did the year before. 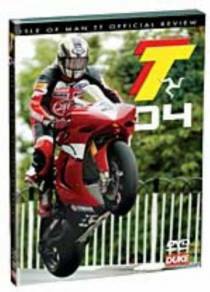 Th is and the Northwest 200 review for 2004 is the best motorbike dvd pair you could wish for. Last year, for some reason, the annual Duke TT DVD was somewhat lacking, probably like the festival itself overshadowed by the loss of DJ. But this year, they've really got their act together. The races are all covered in tremendous detail (as always) but it's the quality of the on-bike footage that really sets this disc apart. There's something indefinably more 'real' about it than I've ever seen before. There's more sense of the speed and the vibration, plus some unusual camera angles too. The trackside footage is from many of the usual viewpoints but also some of the harder to get to sections. If you're used to the kerb-cam at the bottom of Bray Hill, you're in for a shock this year. I won't spoil it for you here. The extras include two full laps with Richard Britton and these are worth buying the DVD for on their own. The on-screen data on the forward facing lap is quite fascinating (how fast does he go past YOUR vantage point? - now you'll know), but it's the lap with the camera pointing towards him that's the real stunner. Coverage of the off-track TT activities is fairly limited, but really those aren't what you buy these reviews for. Better to be there and see them in person. This is a real return to form from Duke. Buy this DVD. Then book your tickets for TT 2005.